Ballroom and Latin dance music CD's! We sell CD's loaded with tracks that we feel will appeal especially to ballroom and Latin dancers looking for practice and/or performance music. Each of these CD's is optimized for dancing. As long as you know the dances you can make it through an entire CD without having to stop! Three music CD's covering six dances for the low price of $20.95. Perfect tempo music for the six most popular ballroom dances is included: mambo, rumba, cha cha, waltz, foxtrot, and tango. What a bargain! Finding perfect tempo ballroom music is difficult. With this one CD set, you have it made. This CD set was specially made for ballroom dancers. Why spend days or weeks trying to cobble together a ballroom music collection when it's all right here? Three music Cd's with 36 songs total for just $20.95. Many folks love listening to tango music whether they are dancing or not. Here is their pot of gold. This set was specially produced for ballroom tango dancers. The most popular tango songs of all time are featured. This music cd is compilation of 14 great hustle tracks. This is great for practicing. The songs range in tempo from relatively slow (101 beats per minute) to relatively fast (120 beats per minute). This is great music that captures the mood of a hustle disco party. Unlike most cd’s that have only a few suitable dance tracks, this cd is 100% danceable. The Ultimate Ballroom Practice Music Collection - Two-Disc Set! Internationally recognized as the best Latin American music, Latin Jam Music CD's have been featured on national television on NBC, ESPN, BBC, The Donny & Marie Show, The Regis Show, and recently in the movie Mad About Mambo. No other CD's specifically produced for ballroom dancing have ever accomplished this feat. 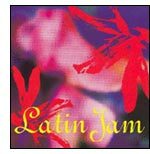 Latin Jam is played at every major competition throughout the US, Canada, Europe and Japan. These CD's have been the top selling CD's at the prestigious Blackpool Dance Festival (World Ballroom Dance Championship) year after year. These CD's normally sell for $28 to $32 at competitions. These CD's are specifically made for dancers. Click on each CD's link below for track listings and to listen to sample audio clips. I suggest using headphones to better hear the full quality. Though most of these CD's contain a variety of songs for cha cha, rumba, samba, jive (swing), and paso doble, Latin Jam Vol. 6 contains only cha cha songs. Some of the CD's include a salsa as well. These CD's are not available through regular retailers. Unlike so many ballroom music CD's that use very dated music from the past, the Latin Jam series uses current Top 40 hits that are re-mastered, resulting in music with extra punch and perfect dance tempo. Unlike many CD's that have only one or two useful dance tracks, all tracks on these CD's will make you want to dance! Please listen to the samples and I'm sure you will agree! These CD's have become enormously popular among line dancers because the cha cha and samba tracks are so exciting. The cha cha tracks are often played in Latin clubs. If you are interested in these great CD's, consider our Latin Jam Special. You'll get the entire series of 7 titles for less than the cost of 6! The smash hit that started the series! Buy all 7 for less than the cost of 6. Save $30!